The entire family can celebrate the holiday at Red Leprechaun, since the bar is starting the party early with a “Family Fun Day,” at noon Sunday. The family day at the Zaferia District spot will include live music from Irish-American honky-tonk band the Whooligans and an Irish dance performance by students from Claddagh Irish School of Dance. A children’s costume contest also is planned. The Irish menu includes the house-brined traditional corned beef and cabbage and green beer from craft brewery Gold Road and Guinness. On St. Patrick’s Day the bar and the outdoor tented patio will open at 10 a.m for a day of live music by Celtic folk band Paddy’s Pig and more green beer and Irish food. There’s no questioning the Irish credentials of this pub and grill on Broadway. 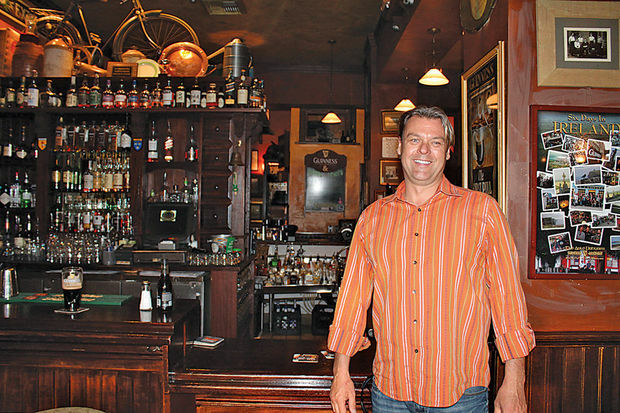 The bar was opened by Irish immigrant and third-generation restaurateur Ciaran Gallagher in 2006 and is always a popular place on St. Patrick’s Day. 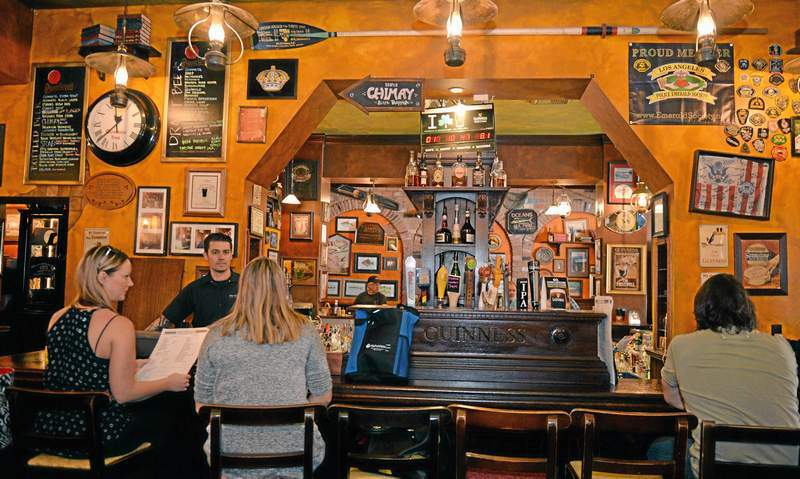 The doors open 9 a.m. March 17 to begin serving traditional Irish meals with a twist like shepherd’s fries, which are Irish-style fries covered with homemade shepherd’s pie and topped with cheddar and sour cream. Live music throughout the day will come from Irish rock band American Wake and bagpipers who will stroll through the bar. Visitors also can expect to see clog dancers. 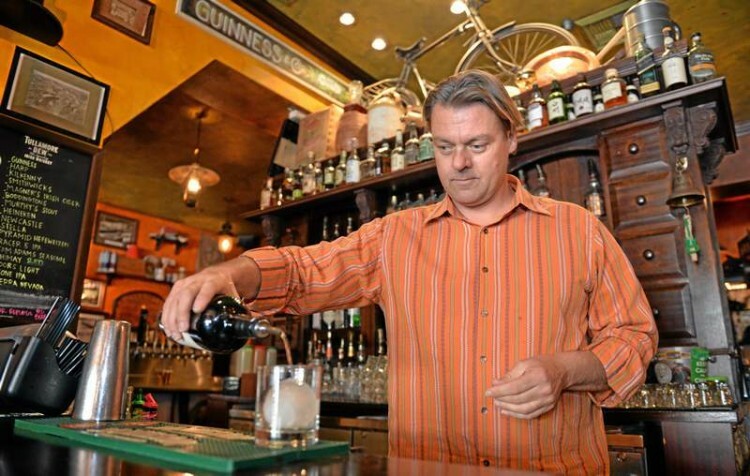 It’s hard to argue with bar owner David Copley when he says that anyone who wants to celebrate in a “truly authentic replica of 2015 Ireland should look no further.” That’s because Copley isn’t just from Ireland, he’s also a nominee for the 2015 Irishman of the Year, a city-organized contest marked by a ceremony at L.A. City Hall on March 13. It’s also hard to argue with a menu that focuses on dishes made with imported Irish products like Kerrygold butter, Dubliner aged cheddar and Burren Smokehouse salmon. There are also more than 80 Irish whiskeys and imported Irish beers like O’Hara’s on hand for St. Patrick’s Day. The bar opens at 9 a.m. March 17 and a band called Humble Hooligans will perform throughout the day starting at 1 p.m.
There’s always a big party at K.C. Branaghan’s in Naples on St. Patrick’s Day. It’s such a busy day that owner George Sabbagh said he does about a week’s worth of sales on that one day. That means it gets packed, so it’s a good thing doors open early at 7 a.m.
“It’s an all-day party and everybody has a good time,” Sabbagh said. Don’t expect green beer or one-day holiday food specials. At K.C. Branaghan’s, the menu is filled with Irish fare like corned beef and eggs, Irish (buttered potato) banana pancakes and Irish sausage rolls. There will be some entertainment on hand, including bagpipers and step-dance performances throughout the day. In case anyone needs any additional help getting into the spirit, St. Patrick’s trinkets like keychains, necklaces and T-shirts will be given away. Yes, shenanigans will be encouraged at Shenanigans with an all-day party that starts at 9 a.m. in Shoreline Village. The celebration will include drink specials like Shamrock Jell-O shots, Tullamore Dew Car Bombs and Bushmills and Guinness Boilermakers. The music will come from Long Beach band Dublin Public, which promises to perform “until we can’t stand up,” according to the band’s flier. Dublin Public is scheduled to be at the bar from noon to midnight — unless they drop first. Richard Guzman covers Arts and Entertainment for the Long Beach Press-Telegram, where he writes about art, theater, music and food. He is a graduate of CSU Northridge with a degree in journalism. Richard grew up in Los Angeles and has written about food, pop culture and art in the area. He has two young children and in his spare time enjoys riding his motorcycle and hiking. Reach the author at Richard.Guzman@presstelegram.com or follow Richard on Twitter: @Richword.